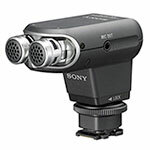 This stereo microphone fits into the Sony multi-interface shoe. The adjustable 0Â° to 120Â° recording angle allows you to fine-tune your audio capture from wide ambient sound to highly selective. An included windscreen enhances audio-quality further by cutting down on wind noise pickup. If youâ€˜re looking to add XLR terminal inputs and audio level controls for a pro external audio input this ECM-XM1 shotgun microphone and an XLR-A1M adapter, allowing connection of your camera to professional-level microphones, mixing consoles and sound studios. The adapter features two XLR channels with separate controls, providing recording level adjustment, attenuation and wind noise reduction. 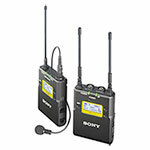 Sony UWP-D11 Integrated Digital Wireless Bodypack Lavalier Microphones ($599) One touch auto-scan for local clean frequency with digital boosting suitable for a wide range of wireless applications such as ENG, documentary work, talk shows, conferences, and more. 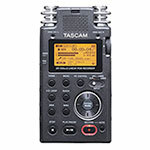 Tascam DR-40 4-Track Handheld Digital Audio Recorder provides professional-level features and flexibility in a compact and durable design that’s ideal for use in the field. The unit can record high-quality WAV/BWF or MP3 files to readily-available SD or SDHC flash memory cards, allowing you to record hours of material and share it easily. The recorder features built-in adjustable condenser microphones, allowing you to choose an X/Y or A/B recording pattern to meet the needs of your environment and application. A built-in limiter and switchable low cut filter reduce peaks and rumble for cleaner recordings. There are a pair of Neutrik combo inputs that accept XLR and 1/4″ connections. 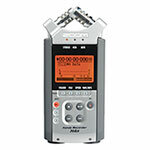 Ideal for recording interviews, lectures, rehearsals, meetings, and more. 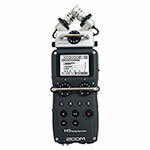 This palm-sized unit packs the ability to record up to 4 channels of audio at greater than CD quality. 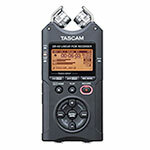 This Zoom audio recorder has long been the Industry Standard though the tide has turned to the Tascam DR-40 mentioned above. 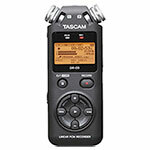 Tascam’s DR-05 puts premium recording quality in the palm of your hand. 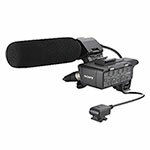 Up to 96kHz/24-bit Broadcast WAV film recording provides better than CD quality to capture every detail. Record WAV or MP3 files to the included 2GB microSD Card, or expand with your own microSD & SDHC media.